So far muthigitonga has created 4 blog entries. H.E. 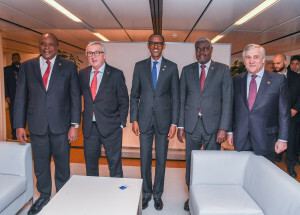 President Uhuru Kenyatta held a joint meeting with President Paul Kagame, Chairperson of the African Union Commission, Moussa Faki Mahamat, EU President Jean-Claude Juncker and President of the European Parliament Antonio Tajani on the sidelines of the Africa-European Union (EU) High Level Forum held on 18th December 2018 in Vienna, Austria. They discussed and agreed on mechanisms for the implementation of partnerships that will go a long way in strengthening relations between the AU and EU. NEW YORK, USA, 24th September 2018 – H.E. 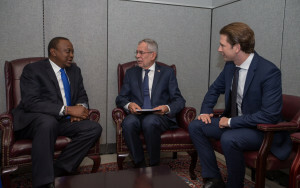 President Uhuru Kenyatta held bilateral talks with the President of Austria Alexander Van der Bellen during which the Austrian leader invited President Kenyatta to the Africa-European Union summit to be held in Austria in December. During the December meeting, Kenya will play a pivotal role as a role model for Africa in innovation and technology at the conference. On his part, President Kenyatta invited the Austrian leader, who was accompanied by his Federal Chancellor Sébastien Kurz to the blue economy conference to be held in Nairobi on 27th November. President Kenyatta further sought Austria’s support in Kenya’s bid for a non-permanent member of the UN Security Council in the period 2021 to 2022. The 62nd Annual Regular Session of the IAEA General Conference is set for 17 – 21 September 2018 at the Vienna International Centre (VIC) in Vienna, Austria, where high-ranking officials and representatives from IAEA Member States will consider a range of issues.